Lori Berenson, a U.S. citizen, leaves the courtroom after a hearing at a Lima, Peru, prison on Tuesday. 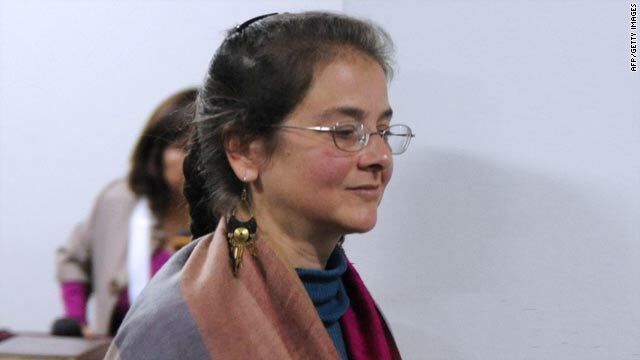 Lima, Peru (CNN) -- Lori Berenson, a U.S. citizen jailed in Peru since 1995 for helping leftist rebels, has been granted conditional release, a judge announced. Berenson has served nearly 15 years of a 20-year sentence for aiding Peruvian rebels in a 1995 plot to overthrow Peru's Congress. Judge Jessica Leon Yarango made the announcement Tuesday in a televised court hearing after Berenson's lawyer, Anibal Apari Sanchez, made the request. Apari, a Lima lawyer and candidate for mayor of a Lima suburb called Villa El Salvador, is also Berenson's husband from whom she is separated, according to her parents. Berenson, 40, who last year gave birth in prison to their son, Salvador, has long maintained her innocence. Her original sentence of life in prison was reduced to 20 years on appeal. The news of her release was welcomed by her parents in New York. "My wife Rhoda and I were ecstatic," Mark Berenson told CNNI. "We were waiting for this day for 14-1/2 years." "We are thrilled that it's been determined that she's earned her conditional liberty and that she and her baby, Salvador, will be able to take their first steps in freedom soon." He said his daughter applied for the conditional liberty, which he referred to as parole, in September. "The process took many months because they had to check on her work records and conduct records in all the prisons that she's been in since 1995." He said she had been working seven days a week co-managing a prison bakery for more than five years in order to shave time from her sentence. On the Web site freelori.org, the Berensons said their daughter and her son will be leaving prison "in a few days" and plan to move to an apartment in Lima, because parole requires they remain in the city in which they were incarcerated. "We do not know if there are exceptions for foreigners or whether Lori will be permitted to travel to the U.S. while on parole," they wrote. "Lori will be a single mom -- Anibal and Lori are legally separated but remain friends and both share concerns for Salvador's proper upbringing," they wrote. "Salvador, now an active 1-year-old boy, will certainly enjoy the opportunity to run around outside the confines of the prison. He is learning both English and Spanish but babbles continuously in 'unknown tongue.' He is a very happy child and loves to be with people." Journalist Maria Elena Belaunde contributed to this story.